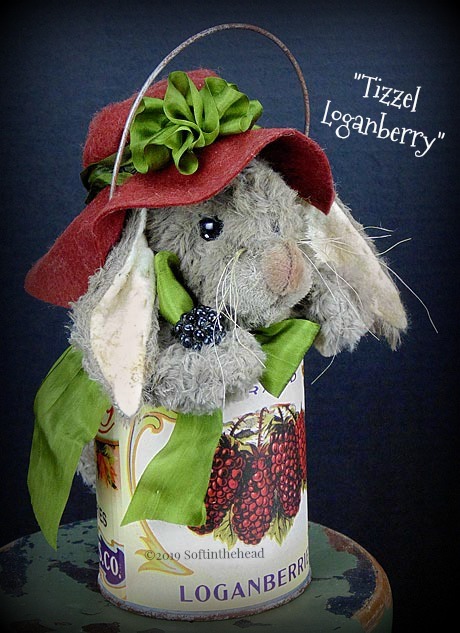 "Tizzel" is a sweet little bunny made using a gray mohair-like fur. 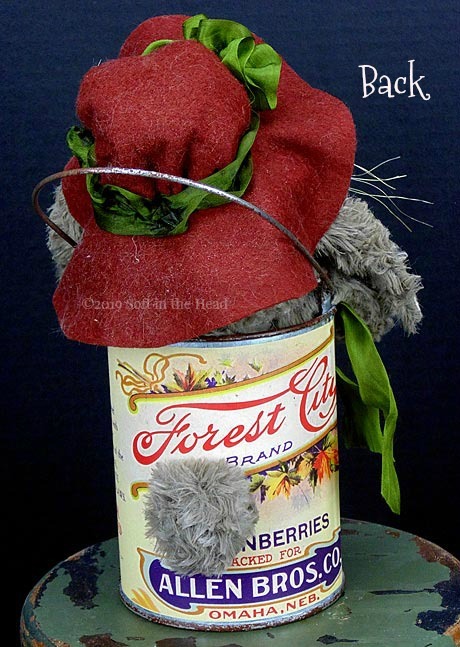 The bunny is wearing a wool hat and trimmed with silk ribbons. 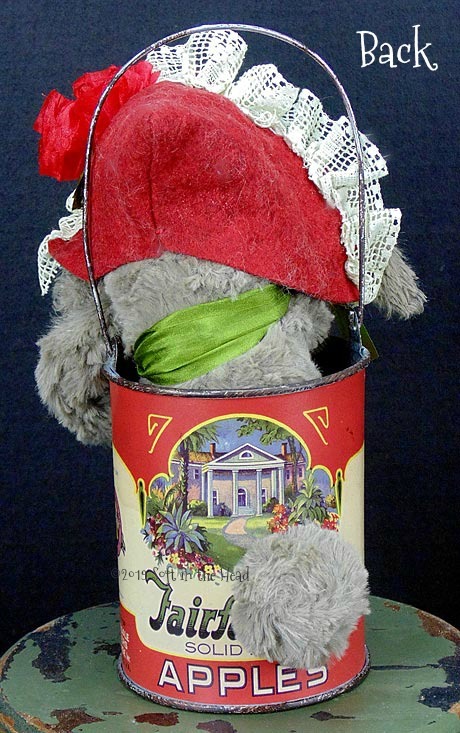 She is nestled inside a vintage looking fruit can. Her arms are bend-able and she is carrying a glass loganberry in one paw. A sweet piece for spring. The whole piece is 12" tall and has a hanger on the can. and will come signed and dated. but for collectors and decoration only. "Tizzel Loganber" is $68 plus $9.00 shipping in the continental U.S. SOLD! "Apple Bunny" is a sweet little bunny made using a gray mohair-like fur. 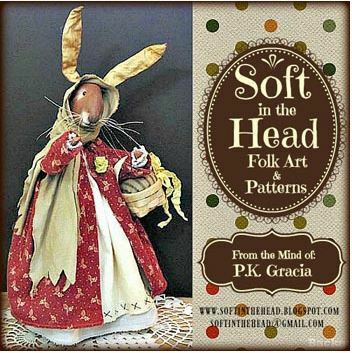 The bunny is wearing a wool hat that is trimmed with lace and silk ribbons. She is nestled inside a vintage looking apple can. Her arms are bend-able and she is carrying an apple in her paws. A sweet piece for spring. 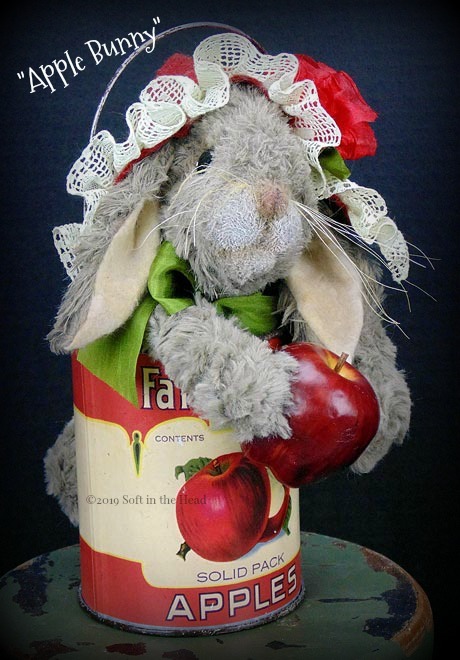 "Apple Bunny" is $68 plus $9.00 Shipping in the continental U.S. SOLD! please e-mail me for shipping elsewhere.